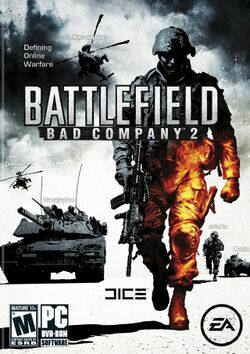 Battlefield: Bad Company 2 is a first-person shooter developed by EA Digital Illusions CE and published by Electronic Arts for Microsoft Windows, PlayStation 3, and Xbox 360. The game is a direct sequel to Battlefield: Bad Company. The game was released in 2010 on March 2 in North America, March 4 in Europe, and March 5 in the UK. Battlefield: Bad Company 2 is set in various environments from around the world, including the mountainous regions along the borders of Russia. Like its predecessor, Bad Company 2 features destructible environments. The system is dubbed "Destruction 2.0," and the level of destruction is extended—players can now completely collapse a building as opposed to only blowing out walls. Along with Battlefield Vietnam, Bad Company 2 is one of only two games in the Battlefield series to have blood without third-party modification. Two limited editions of the game were released - the first was the Bad Company 2 Limited Edition. This version of the game allowed players four unlocks for vehicles and two WW2-era weapons. Both the unlocks and the weapons can be obtained by players who do not have the Limited Edition. The second limited edition of the game was the Bad Company 2 Ultimate Edition. This edition is available only for the console versions of the game. It includes the aforementioned unlocks and weapons in addition to Battlefield 1943 and Bad Company 2's Onslaught mode, which is currently console-specific. VIP Map Packs must be obtained via a special code entered with every new copy of the game. Players lacking the codes must pay for the maps. PC players automatically download the maps along with any other patch, and don't pay extra. Available for purchase for PC and consoles. Kit Shortcut All weapons and specializations for all classes. Costs $20.00 USD (1600 MS Points) for all shortcuts. Onslaught See Intro to Multiplayer. Costs $9.99 USD or 800 MS Points. This page was last edited on 16 August 2016, at 16:08. This page has been accessed 23,191 times.